Someone manages to come along and do something heartless and stupid. We have had two of those this week. The first one is a truck pulled up at our gate before we opened and pushed a dog out. The SPCA is on a very busy street so we were glad that the dog chose to run in the direction of the shelter and not into the street. It took staff two hours to catch him. 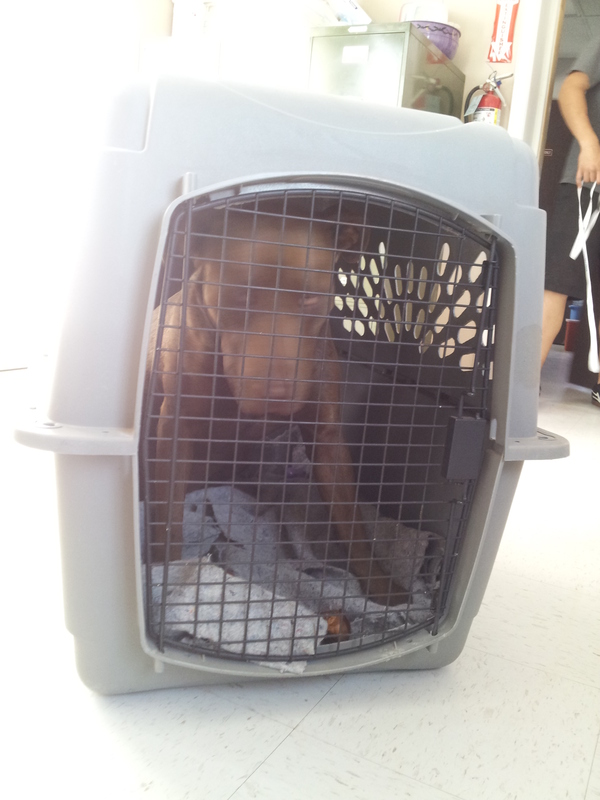 The second and probably the worst one was this dog in the crate. We got a phone call that someone had left a dog in a crate out with the garbage cans hoping the garbage men wouldn’t notice and pick him up too? A nice couple found him and called us then brought him in. It was obviously not their dog. He was completely freaked out and I can’t say that I blame him. At least they left him at the SPCA gate instead of a field somewhere…. We hear that a lot also. Yes we are better able to care for them BUT we are also on a VERY busy street. It is really hard on our staff when they find them in the morning when they have been hit by a car trying to follow the car home. It happens, more often than you might think. The SPCA like most shelters operate above capacity. We ALWAYS have more animals in residence here than we should. If we get too many then it is possible that the quality of care and attention the animals get can be compromised. If you are told we are full and we can’t take your animal in that is most likely the reason. The most recent case of left at the gate is “Dobbie”. Staff members found Dobbie a 3 lb Chihuahua left at our front gate about 9:00 pm. They had gone back out to check on something and found him there. It was freezing and windy and he was terrified. On a normal evening he would have sat out there until 7 am or so. It could have been really bad because he was in a very small crate and he is tiny so the crate blowing into Peabody Rd and traffic was a real danger. As a result we have had to work very hard to gain Dobbie’s trust as you can imagine. Currently Dobbie is being fostered by a volunteer and a couple members of the staff. He was not doing well in the kennels so his growing fan club decided it would be best for him to be in a home environment to give him the best chance at finding his forever home. So now he sleeps with his fosters in the bed, under the covers and during the day when the SPCA is open for adoptions he gets to hang out in a crate in the office. 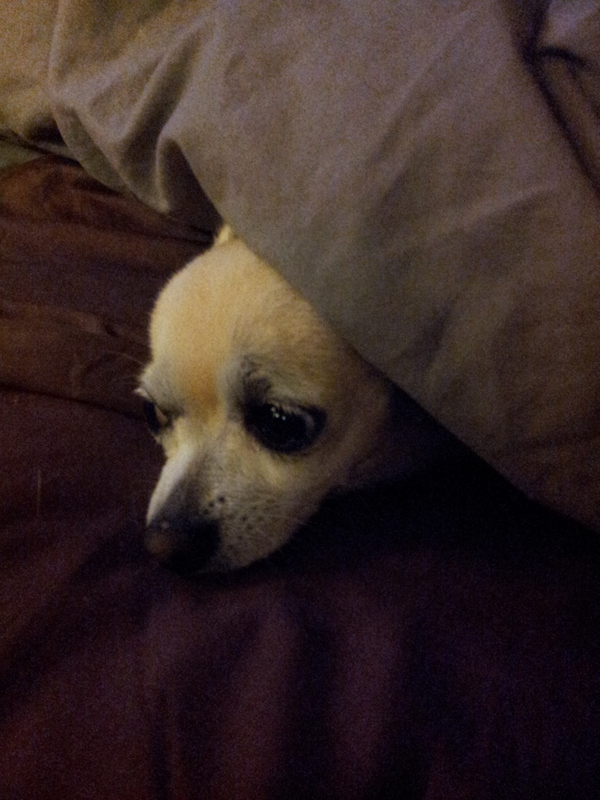 The noise of the kennels sends him right under his bed and nobody will be able to see his cuteness to adopt him. If you are looking for a tiny little companion that thinks he is a big dog he might be the one for you. Come on by the SPCA on Peabody Rd in Vacaville during regular adoption hours to talk to the staff about him and meet the little guy. #PUPDATE They are ready to go to forever homes!! Posted in: Animals, Pets, Rescue, spay/neuter. Tagged: adoption, animal, Cats and Dogs, chocolate, dog, lab puppies, pitx puppies, Rescues and Shelters, SPCA of Solano County, volunteer. Available for adoption Saturday August 9th. What kind? It is hard to say. 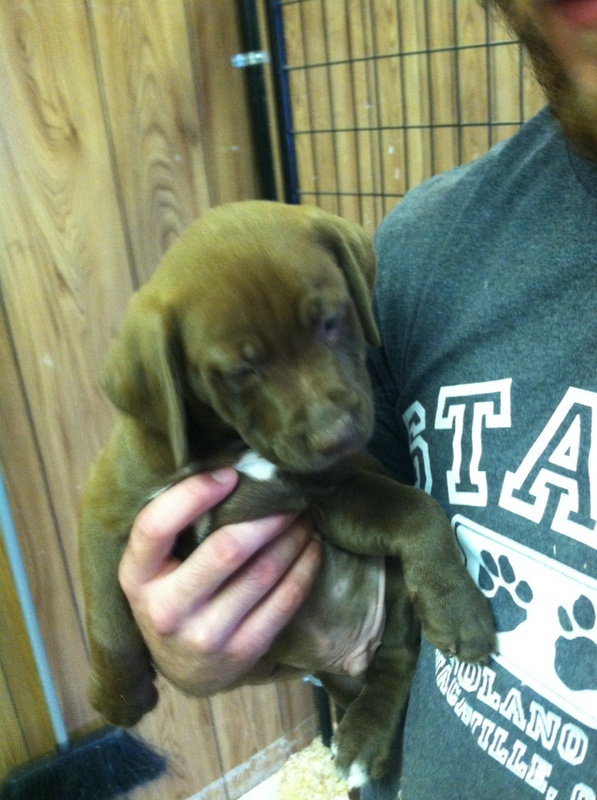 We think maybe lab/pit mix and maybe not. These little cuties will be going to new homes this weekend. Is one of those new homes yours? 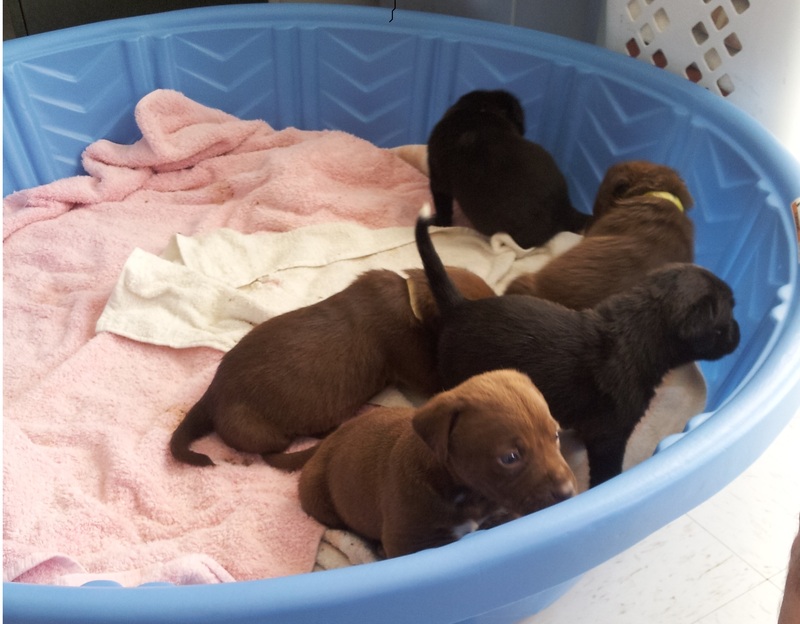 They came to the SPCA when someone found them in a box in a Fairfield park at 2 – 3 days old. SPCA took them in and raised them until they were old enough to go to forever homes. They have all been spayed or neutered, vaccinated and have had the first of their puppy shots. These puppies will NOT go to homes on a first come first serve basis. There is an application that must be filled out and reviewed. 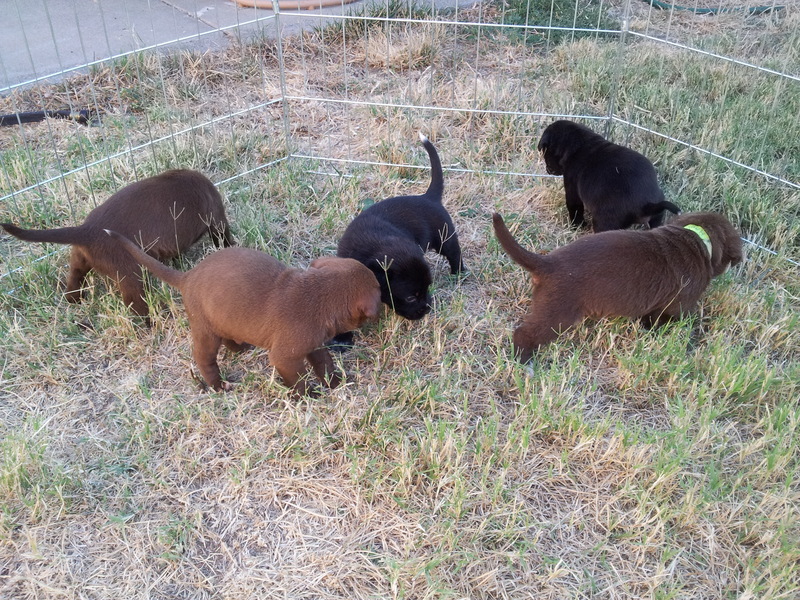 If it looks like you will have a home situation suitable for a busy large breed puppy, and these guys are VERY ACTIVE we will contact you to come in for a meet and greet. You will also need to bring proof with you that you can have a dog or an additional dog with NO WEIGHT OR BREED RESTRICTIONS. The fact that you currently have a dog is NOT proof you can have another one. Download and fill out the application and personality profile. Email all three pages back to us at solanospca@gmail.com We will be contacting approved applications to come do a meet and greet.